PHOTO BY JIM CONNER Stay the Plow plays country music, now without the irony. 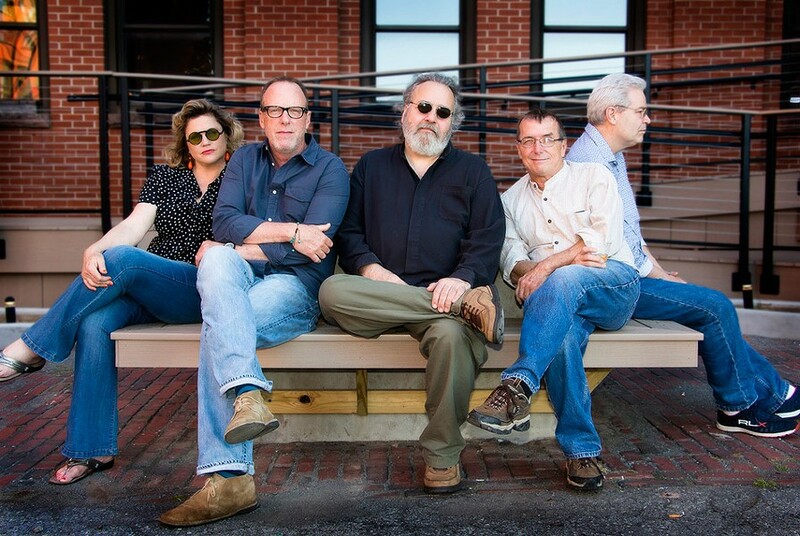 The band is (from left to right): Nelle Porter-Jones, Dell Delray, Jeff Gilhart, Tim Clark, and Jim Conner. Sometimes a band will come off so flawless onstage, it seems unreal. Dig this: When Americana darling Stay the Plow finished up its recent set at The Little Theatre Café, pumpin' piano cat-in-the-hat Paul Nunes was gobsmacked. He approached singer Nelle Porter-Jones. "He couldn't believe the songs were originals," Porter-Jones says. Nunes told Porter-Jones he didn't realize they were written by the band, "They're that good," Porter-Jones recalls him saying. "Well, why would I go up and do bad ones?" Porter-jones says. She was initially put off by the remark until she considered its sincerity. "It was probably the best compliment I've ever been given," she says. Stay the Plow arose from the ashes of Dang!, a tongue-in-cheek country outfit that some people didn't get. "It was supposed to be an ironic country band," says Tim Clark, Stay the Plow rhythm guitarist. The band leaned into the over-the-top aspects of country music with "Aww shucks" hokum. But in the end the band began to morph into classic country. "And the people who liked classic country stayed away in droves," Clark says. "They wanted to hear it exactly like they were used to hearing it. We brought a lot of other elements and dynamics into it. But nobody was interested in hearing the progressive twists that we put on it." Twists like when Porter-Jones sang "Stand By Your Man" like Pat Benatar. Stay the Plow, which is made up of Porter-Jones; Clark; Jim Conner on drums; Jeff Gilhart on lead guitar; and Dell Delray on bass, slugged away as Dang! for 13 years before letting it dissolve and reemerge as Stay the Plow in 2015. "We were like, 'What are we going to do with this band?'" Clark says. "We liked the way it sounded. We were happy with each other, it was drama free." Porter-Jones isn't so sure. "Were you in the same band I was in?" she says to Clark. Clark had been working with Porter-Jones, fleshing out her original material and putting together some demos. They played them for the newly-formed Stay the Plow. "So we brought it to the band," he says. "And everything we had developed with the band, we applied to her songs. And it was great. We were really energized by it. The response was better than when we played the familiar songs." The new energy kept the band going now with some more cut in its strut. It was either that or call it quits. "It wasn't a question of throwing in the towel," Clark says. "We just wanted to go in a direction that was relevant. We were clearly struggling with relevancy. Being Dang!, doing what we were doing, we had a lot of recognition but we had no engagement." The new material was the shot in the arm the band needed. "And Nelle's songs are exciting," says Conner. "Lyrically, they're very story-based. You can read the lyrics like a story: beginning, middle, end. And they're interesting topics, like diving horses and carnival boys." You can see the story her words paint on the song "Diving Horses." "Diving Horses on the pier / Look so small from way down here / Hey there mister, don't make him fall / Though I paid my dime just like 'em all"
"I love history. I love sepia," Porter-Jones says. "'Finding your way' is a driving component and a main ingredient in my songwriting as well." "Also a little hope, a little remorse, a little longing, and trying to get out on the other side," Delray adds. But no irony. "I don't think there's any irony in the music now," Porter-Jones says. "Here's irony for ya," Clark says while jerking his thumb in Porter-Jones's direction. "Irony in the fact that she's my ex-wife."